DOCTOR WHO: Companion Pieces - ACE | Warped Factor - Words in the Key of Geek. Tony Fyler checks through his rucksack for one last can of Nitro-9, and gives a nod to Ace, the definitive Seventh Doctor companion. When it became clear that Bonnie Langford was leaving Doctor Who, and taking the Jolly Hockey-Sticks Melanie Bush with her, there was a sense that the new companion would be a feisty teenager with a bag of tricks. But oddly, for a while, there were two feisty companions with bags of tricks in contention: Ray, the so-dumped-it’s-painful Welsh 50s mechanic with a bag full of socket wrenches and other useful tools… or Ace (real name Dorothy), the mouthy teenage waitress from Perivale who blew up her school’s art room and flew up to Iceworld in a time storm (for which, read tornado, taking her to Oz). 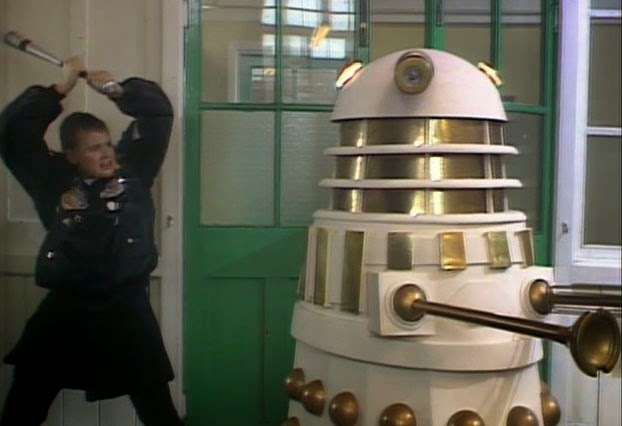 Screen tests and auditions gave the permanent spot in the Tardis to young Sophie Aldred and her more contemporary pseudo-street interpretation of the angry young teenager assayed in Tom Baker’s day by Louise Jameson’s Leela. Ace would go on to be one of the most deeply-backstoried and most evolved companions in Classic era Doctor Who history, if not the most. That’s a little ironic as she came into play the antithesis of Mel, possibly the least deeply-backstoried and least evolved. To some extent of course the great length of Ace’s development in the Seventh Doctor’s company is a perverse result of the cancellation of the series – she continued her development in Virgin novels, and is still going strong with the Seventh in Big Finish to this day, in a way which feels much more organic and contemporary than many companions who come back to life in audio as their stories are slotted in to a timeline that feels definitively over. But having never seen how Ace’s story with the Doctor ended on screen, she feels somehow more alive out there, a perpetual young woman, somewhere out in Neverland, always getting better, but never really older. Her arrival in Dragonfire showed up the flaws in the writing of Bonnie Langford’s Mel – compared to Ace, she was very Enid Blyton, very distant from many of the viewers. Ace used a kind of BBC-safe street slang – div, prawn etc all being employed to make sure that the teenager never actually swore. But she was young, and didn’t care, and wasn’t above tipping a milkshake over a demanding customer and getting herself fired in a moment of anger. Nor, crucially, was she undamaged or breathlessly, instantly loyal – when Kane tempts her with his coin, Aldred’s young portrayal really works, and for a long moment, you think she might just take it and wipe out all the bad memories she has. The fact that Mel practically has to beg the Seventh Doctor to take the young urchin on board does a degree of disservice to Aldred’s early promise in the role, but after one of his best speeches in parting from Mel, the Seventh Doctor and Ace are instantly a perfect, and the definitive, pairing of the era. Ace’s arrival is a serious dividing line in the quality of the storytelling and the arc that’s achieved in the Seventh Doctor’s time, and it’s a mark of the oddity of 80s fandom that while it wasn’t able to understand the idea of a character arc for the Doctor in terms of Colin Baker’s journey from spiky and irascible to more likeable, when the journey was made the other way around in Sylvester McCoy’s time, it was welcomed by fans across the board. Ace’s arrival marks the beginning of everything McCoy’s Doctor is well remembered for – the darkness, the manipulation, the playing of games on a cosmic scale. You couldn’t do that with a character as emotionally one note as Mel: you needed someone as complex and conflicted as Ace to take the storytelling forward. And how she did! Season 25 opened with a barnstorming new Dalek story from a writer new to Who, Ben Aaronovitch, and managed to take Dalek chronology dynamically forward, revisit the Doctor’s past in a new and exciting way and give Ace more to do than say “What’s that, Doctor?” She destroys Daleks with everything from a baseball bat to a bazooka, and gives the Doctor the Nitro-9 explosive to despatch his first Dalek too (you just know she’d love to get her hands on Leela’s Janis Thorns). But more than that, she falls for a handsome bloke, confronts the harsh racist realities of the early 1960s and even manages to give comfort to the young abused child who has been acting as a Dalek operative. If Dragonfire gave just a hint of her potential, Remembrance brought it roaring to the centre of the screen. The barely bitten-back rage that found expression in ultra-liberal sentiment gave many young viewers a touchstone with whom they could identify, and to this day lets Ace stand tall in the gallery of Classic companions. In the Happiness Patrol, perhaps the most openly political story since The Sun Makers, Ace is a more specifically contemporary teenager – she understands the “Thatcherism” of Helen A as a thing recognised from her real life, she recognises the disingenuous smile and the heart of steel, the idea that harsh measures have to be taken “for the greater benefit”, while the Doctor is more content to wander through a musical metaphor, playing the blues as King Killjoy. In Season 26, three of the four stories take Ace dramatically forward. 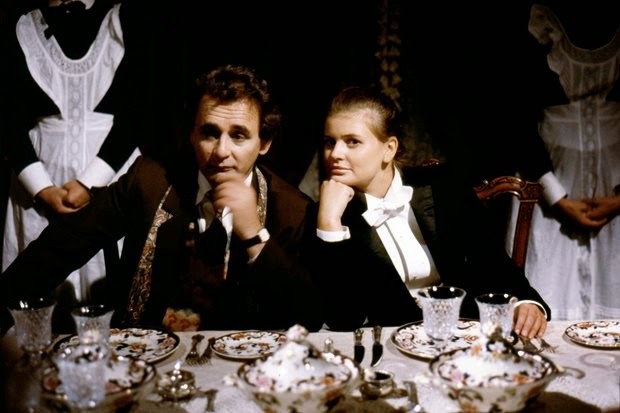 In Ghost Light, we see the manipulation of the Seventh Doctor as he forces Ace to go back to a place she has specifically told him she never wants to go, to face the truth about the sense of evil she had at Gabriel Chase, before burning it to the ground. It’s a tense performance when Ace rounds on the Doctor with accusations, and – more than any time before or since, we wonder if our Doctor is really a good man after all. He mutters that he did it to make her face the dark parts of her memory, but it comes across as a bit rich from an incarnation composed almost entirely of secrets and dark knowledge. But having forgiven him for the manipulation of her psyche, you’d think Ace had earned a bit of a break. Nothing of the sort is given her though, as she steps straight into The Curse of Fenric, where her psychology is manipulated not only by the Doctor but by Fenric too, the two grand masters of cruel gameplaying converging around the Perivale girl who hates her mother. The revelation that the baby with whom she has bonded will become the mother she despises is harsh enough, but in a story about the power of faith, the Doctor is forced to destroy Ace’s faith in him by hurling harsh words about her into the universe – hearing him call her an emotional cripple was a punch in the stomach of fandom in 1989. Fenric is an unusual story in a lot of ways, not least because it shows Ace being aware of her power as a young woman: she diverts a guard by almost overtly sexual flirting, and prefaces the scene by reminding the Doctor (and us) that she’s “not a little girl.” But more than that, it’s extraordinary because it not only recognises that a companion has a troubled backstory but puts that backstory right at the heart of the story. Ace’s backstory stayed front and centre in what was to become the last of her on screen adventures – Survival. In fact, having taken the girl from Iceworld, through her darkest fears and her conflicted backstory, the Doctor actually takes Ace “home” to Perivale, where weird cat-based shenanigans ensue among her old mates. The story is a deeply symbolic examination of anger, and how it can power you to survive in a competitive situation, but is ultimately self-destructive. It’s a very ‘Ace’ theme, and at the end of the story, there’s a sense that all of Ace’s demons have finally been exorcised. The Doctor could have left her there, ready to take on the world as a grown-up, but instead, she leads him “home” – to the Tardis. As the sun set on the uninterrupted history of Doctor Who, there was a sense of Ace’s original arc ending, with a young woman finally ready to meet the universe on its own terms, without necessarily blowing it to bits. The rest of course is Whovian history – the series ended, and Ace went on in books and audio adventures. In the audio world, she has become more and more savvy with undercover work, and particularly working well with a Tardis-friend (Strong Ace stories abound in Big Finish, but try The Harvest, Colditz, The Magic Mousetrap, and Afterlife for a handful of the best). And on she goes, the teenaged Ace having come to terms with her given name, Dorothy McShane, and using her skills, rather than her explosives, to change the universe for the better. Forever.